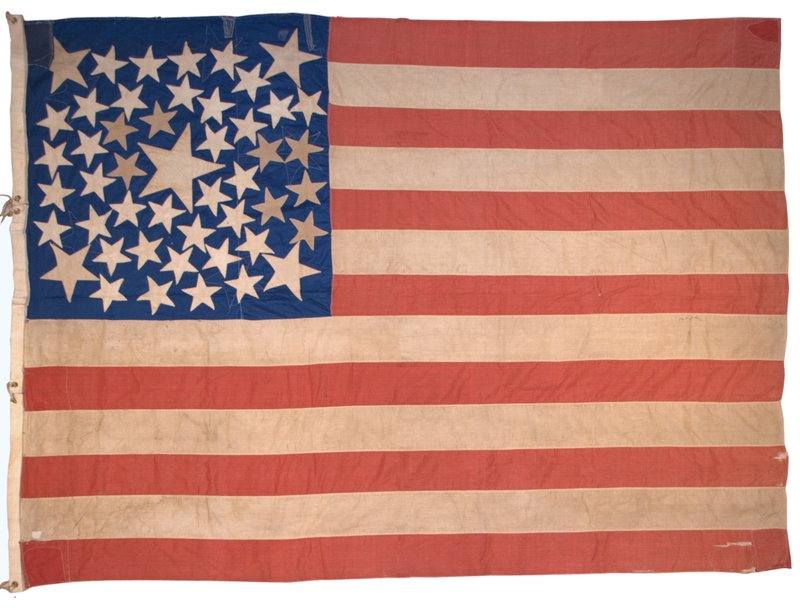 This 48 star medallion pattern flag, IAS-00002, is one of the earliest acquisitions of the Rare Flags collection. Until recently, the purpose for the unusual pattern on the reverse of the flag was a mystery. 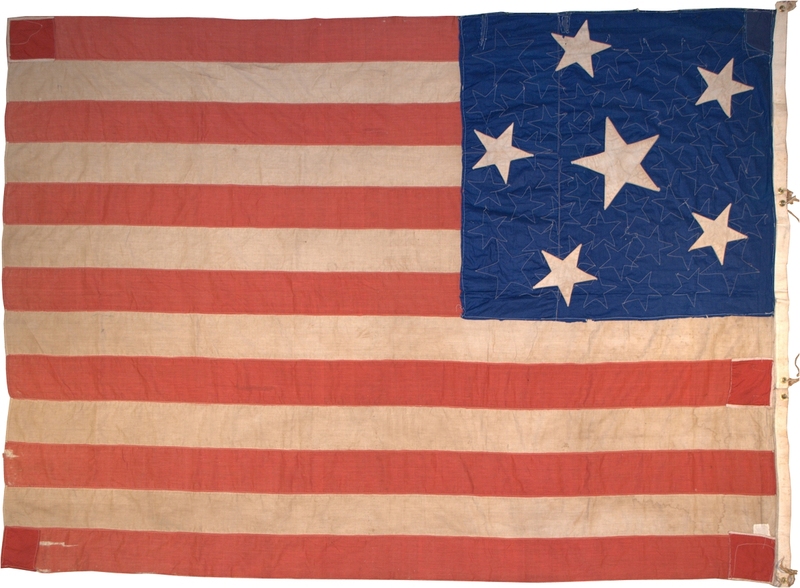 The flag surfaced in Ohio, but its specific history and maker was lost over time. The spectacular medallion on the front of the flag makes the flag one of the most unique examples of the 48 star count. Originally, I wondered whether the flag maker had simply run out of fabric for the stars on the reverse and opted for a simpler pattern. But in retrospect, after years of collecting, I've learned that the traits of early flags are very seldom unintentional. Great care went into making flags, and while at some times and places in history fabric may have been scarce, a flag maker who puts such time and effort into a flag such as this one will have the materials they need to make the design they intend to make. In the case of this flag, the reverse of the flag is very precisely planned and executed. For example, the stars are very accurately sized and stitched, with the a tip of each of the five outer stars pointing directly to one of the tips of the large central star. The pattern is clear and intentional. It was only after happening upon a postcard photo in the Smithsonian collection that the symbolic meaning of the pattern became plainly obvious. The postcard, dated 1911, shows a suffragette adding a sixth star to the Women's Suffrage Flag. Debate on the floor of Congress against the Women's Suffrage movement makes mention of the adoption of the American flag for the movement's purposes, and this postcard is evidence of the practice. Wyoming, Utah, Washington, Colorado and Idaho were the first five states to grant women the right to vote, the last being Idaho in 1896. From 1896 to 1911, though, the movement seemed to stall, with no additional states granting suffrage rights to women. Vigorous campaigns in California, Ohio, and other states tried to push state-level legislation through on the issue. In November, 1911, California became the sixth state to grant women's suffrage, and in 1912, the western states of Oregon, Montana, Arizona followed suit. 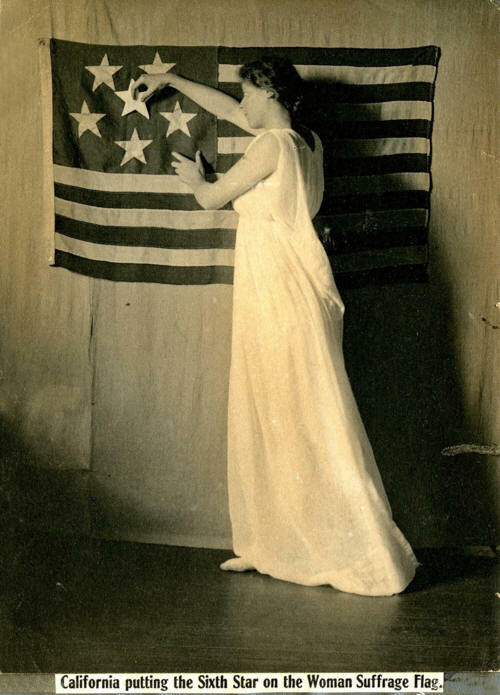 The addition of the California's "sixth star" to the women's suffrage flags, banners and pin-backs in the 1911-1912 period, was an important symbolic milestone for the movement. The "six-star" flag also happens to coincide precisely with the introduction of the 48 star flag. New Mexico, 47, entered the Union on January 6, 1912, and Arizona, 48, entered the Union on February 14, 1912, just 2 months after California granted women the right to vote. On November 5, 1912, Arizona granted women the right to vote, which means that this flag, made to celebrate both Arizona Statehood and California's Suffrage vote, dates from the period of February-November 1912. It has always been my opinion that this flag was a very early 48 star flag, since its extravagant medallion pattern doesn't conform to President Taft's executive order of June 12, 1912, which declared that flags henceforth should be standardized to a pattern of 6 even rows of 8 stars. This also narrows the date of this flag to the first half of 1912. This flag is the only surviving Women's Suffrage flag in the Stars and Stripes pattern that I am aware of. As such, it is a true national treasure and symbol of American progress.